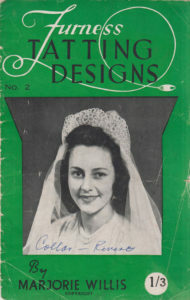 This is the second booklet in the Furness Tatting Designs series from New Zealand. From the Victory rolls in the illustration on the back cover, I would date it to the 1940’s. 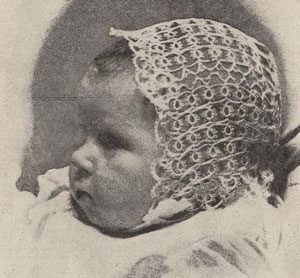 This booklet contains many decorative edgings and motifs, the bridal “halo” shown on the cover and a stunning baby bonnet that would be beautiful to make for a formal christening.